There’s nothing quite like being able to dip some fluffy bread into a prepared cheese sauce. Or you might want to cook succulent meats or seafood in a tasty broth. A decadent chocolate sauce might prove to be a knockout dessert for dipping fresh fruits. 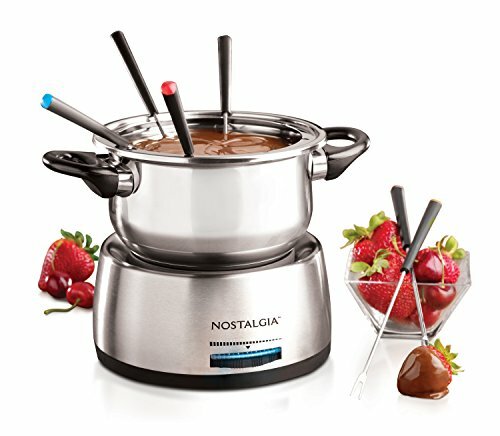 This electric fondue pot from Nostalgia can meet the needs of most fondue enthusiasts. Let’s see what it has to offer. The Nostalgia 6-Cup is a perfect addition to any cook’s arsenal. While some might prefer a traditional fondue pot with a flame burner, this electric model can work just as well. As you have no open flame to worry about it is safer to use, and you can also control the temperature much easier. This pot is suitable for cheese, broth, sauce, and chocolate fondues. It has a 6-cup capacity, equivalent to approximately 3 pounds. It measures 8.7 inches by 8.7 inches by 8.3 inches and weighs 2.5 pounds. The Nostalgia pot is made from polished stainless steel, making it stylish enough for the most elegant of dining tables. It has black handles which are cool to the touch during operation. As a result, you can move it easily from countertop to table, and back to the sink for washing up. There are six forks with different-colored handles, so your guests each have their own utensil for cooking or dipping. The forks also sit comfortably in the grooves around the edge of the fondue pot when not being used. The base houses the heating element and a has blue backlit dial for adjusting the temperature. The cord can be stored neatly in the base when the unit is not in use. The appliance comes with an instruction manual, which contains some recipe ideas. It also has a one-year, limited warranty. The feature which I like the most about this item is the ability to control the temperature. Once the sauce is prepared or your chocolate is melted, you can set the temperature to keep it hot without burning it. It heats up quickly and keeps the temperature constant once it’s set. Some people use it purely for melting chocolate for dipping and baking needs. They find it serves this purpose perfectly. Cleaning the pot is a breeze. I have found that, even after burning food in it, it washes quickly and easily, leaving no stains or residue. The appearance of the pot is also appealing, the stainless steel finish is stylish and chic. The 3-pound capacity is able to deal with the quantity most want for their sauces, cheese or chocolate and it comfortably serves a course for 4-6 people. The ease of using an electric unit, as opposed to one that needs fuel and has a flame, is a real bonus. At an affordable price, some of my friends even have several pots. This means they can have a fondue party serving cheese, broth, and chocolate. All three dinner courses are then taken care of without the need to wash and refill. Along with the positives, there are some negatives. At 2.5 feet long, the power cable will need an extension cord to use the pot when it’s not on the kitchen counter. For example, if you want to serve up on a dining table, a trailing extension cable is not ideal. The other setback is the unit itself has an advisory warning that it should not be used with oil. Some people say they used oil in it successfully, however. I’d rather use it with caution and stick with chocolate and other sauces instead. Nostalgia produces many products for creating memorable experiences. As well as the Nostalgia FPS200 6-cup electric fondue pot, they produce many other time-saving appliances for the kitchen. They aim to make family parties fun, creating tastes of the past with modern day appliances. If you are looking for an easy-to-use, convenient fondue pot, this could be the one for you. It is stylish in appearance and the temperature is easy to control. It is ideal when family or friends get together to have some fun. Filled with cheese or chocolate, plus a few nibbles for dipping, it’s the perfect snack while you’re watching a movie.